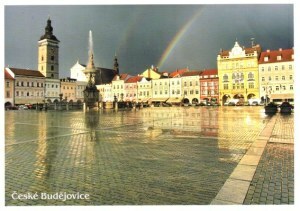 České Budějovice is a statutory city in the Czech Republic. It is the largest city in the South Bohemian Region as well as its political and commercial capital, the seat of the Roman Catholic Diocese of České Budějovice, the University of South Bohemia, and the Academy of Sciences. It is located in the center of a valley of the Vltava River, at the confluence with the Malše.